NBA Partners with Brotherhood Crusade for All-Star Weekend to Highlight South L.A.
NBA All-Stars James Harden, DeMarcus Cousins, Damian Lillard and Andre Drummond were joined by NBA legends AC Green, Jason Collins, Muggsy Bogues, Horace Grant and Felipe Lopez and the WNBA’s Swin Cash, Imani McGee-Stafford to share their concerns with how police relations has affected urban communities. 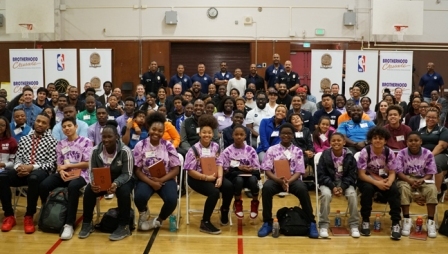 Students, law enforcement officers, community leaders and the NBA representatives were divided into small breakout groups and assigned topics ranging from commitment to diversity. 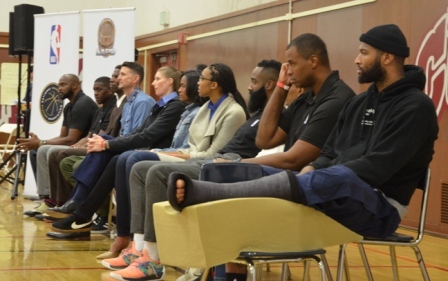 “We discussed a lot of words and what they mean to everybody and how they can come together to make things a little more peaceful,” said Portland Trail Blazers All-Star Damian Lillard. Davon Hunt, a tenth grader at Washington High School, addressed the room following the breakout sessions. It was a mutually receptive exchange for the officers from LAPD. The Brotherhood Crusade continues to provide a safe space to facilitate complicated conversations related to social justice and community engagement. Leaders like LeBron James, Carmelo Anthony, Chris Paul and Dwyane Wade who have continued to be at the forefront of social justice issues. In 2016, four of the NBA’s premiere talent used the opening moments of the ESPYS to encourage social change. “This isn’t just about sports, about the NBA or the NFL, it’s about a certain demographic that continues to be targeted with the police departments, the state and everything that’s involved with injustice with people of color,” said Eric Aguilar assistant program director for the Brotherhood Crusade. Shortly after the ESPYS, the NBA partnered with the Brotherhood Crusade as the inaugural launch event for NBA Voices in Los Angeles in 2016. “The NBA is the perfect example of what professional sports and the community who admire their players should look like,” Bakewell Sr. said. Since then, the NBA has done nearly 300 events spanning from community conversations to building bridges through basketball and mentoring. All-Star weekend in Los Angeles was another opportunity to continue the efforts set forth by the NBA’s initiative. “All-Star is a time when the NBA comes together, so we have the entire NBA family current and former players partners guests and it’s an opportunity to be able to use the sport to bring people together and to lift people up,” Jacobson remarked. A group of local youth from Brotherhood Crusade were able to attend the All-Star game at Staples Center on Sunday, Feb. 18.